"February 2024: Desperate to find refuge from the nuclear storm, a group of civilians discover a secret government bio-dome. Greeted by a hail of bullets and told to turn back, the frantic refugees stand their ground and are grudgingly permitted entry. But the price of admission is high." 283 years later... Sunny O'Donnell is a seventeen-year-old slave who has never seen the sun. She was born in the Pit, a subterranean extension of the bio-dome. Though life had never been easy, lately it had become a nightmare. Her mom was killed in the annual Cull, and her dad thought it was a good time to give up on life. Reyes Crowe, her long-time boyfriend, was pressuring her to get married, even though it would mean abandoning her father. She didn't think things could get any worse until she was forced upstairs to the Dome to be a servant-girl at a bachelor party. That's where she met Leisel Holt, the president's daughter, and her fiance, Jack Kenner. Now Sunny is wanted for treason. If they catch her, she'll be executed. She thought Leisel's betrayal was the end. Turns out, it was just the beginning. 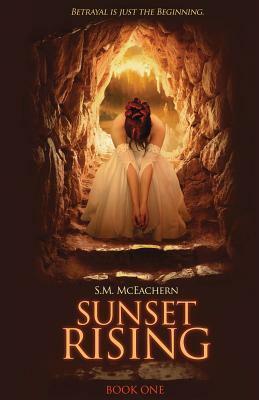 Sunset Rising is Book One of a series." S.M. McEachern (also known as Susan) comes from the rocky shores of Canada's East Coast. As a resident of Halifax during her early adult years, she attended Dalhousie University and earned an Honors Degree in International Development Studies with a focus on ocean development. Throughout her academic studies and early career, Susan had the privilege to study and work with many developing nations on resource management projects. "Sunset Rising" is her debut novel and the first of many she plans to write.